NPR's Code Switch team visited Martina McGhee's course, Race and Identity through Pop Culture. (Dec. 12, 2018) -- Topics related to race and identity are difficult to discuss in a honest and transparent manner. Students at The University of Texas at San Antonio (UTSA) have been openly discussing such subjects this fall semester in a new course offered through the UTSA African American Studies program. The course, Race and Identity through Pop Culture (AAS 4013), is taught by Martina McGhee, a doctoral fellow in the UTSA Department of Interdisciplinary Learning and Teaching. During the course, students listened to NPR’s Code Switch podcast, utilized other digital resources and were challenged to think about race and identity theory using these tools. The Code Switch team visited the UTSA Main Campus to attend two class sessions and to hear what students had to say about the podcast and their experience in the course. >> Listen to the National Public Radio story about the UTSA course. 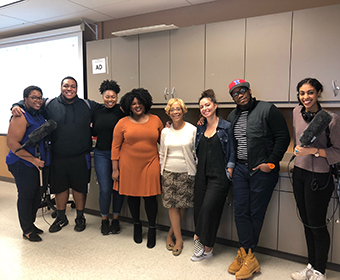 “By incorporating podcasts and different forms of media into the curriculum, I wanted to provide affordable access to education,” said McGhee. McGhee said she designed the course around the conversations aired by Code Switch to ensure the cost of the class was inclusive to all students. The undergraduate students were also required to produce their own podcasts and would carry on the discussions they had in the classroom on Twitter by using the hashtag, #UTSAAAS4013. Throughout the semester, McGhee said she hosted guest speakers from different backgrounds who were able to share their experiences with students and to get their take on race and identity. “Conversations like these aren’t happening very often in other classes,” said Zach Truesdale, a senior from Arlington, Texas, majoring in English and minoring in African American Studies. “I didn't realize how important my voice was as an African American woman until I decided to minor in African American Studies at UTSA,” explained Michaela McClendon, a junior from Killeen, Texas who is studying psychology. This discussion-based course also allowed students to take part in a scavenger hunt meant to teach them about the racialized experiences some people may face when they're trying to enjoy the outdoors because of the limitations in access to sports equipment and transportation. Students also took part in respectful conversations about issues affecting the LGBTQ community, and topics about immigration and stereotypes. “Ultimately, I want to teach my students how to facilitate these tough conversations in a civil and educated manner. The real test will come when they’re out in the world and how they will engage and respond to others. I want to plant the seed of how to carry on impactful conversations now for them to use down the road,” said McGhee. McGhee will be teaching this course during the Spring 2019 semester. Listen to the National Public Radio story about the UTSA course. Learn more about the UTSA African American Studies Program. Learn more about the UTSA College of Education and Human Development.